While the great outdoors are a great way to blow off steam and have some fun, they can quickly turn dangerous. 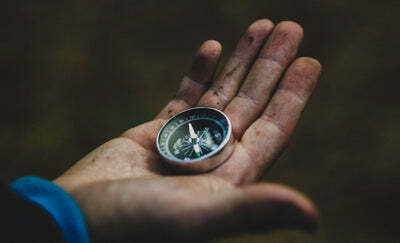 When you lose your way and you need to find your way back to civilization, knowing a few natural, non-tech navigation tips can help. Here are the best ways to use nature to your advantage when lost. One of the best possible natural, non-tech navigation tips is to check where the sun rises or sets. The sun always rises in the east and sets in the west. This can help you to get your bearings and know which direction you want to head. Of course, if you are lost at night, rather than wait for sunrise, you can also look at the moon. One of the best natural, non-tech navigation tips is to look at where the moon sits in the sky. The moon can’t be used in the same way as the sun in terms of a rising or setting, but it does follow the same general path as the sun which can help you determine east and west. Another way to use the sun for navigating is to use shadow sticks. Shadow sticks are twigs or sticks from a tree you place in the ground standing up in an area of direct sunlight. You will then look to see where the shadow falls. The sun moves in the east 15 degrees per hour, so this can help when it is midday and impossible to tell if the sun is in the east or west. While winds can blow in any direction, they most commonly blow from the west to east, so this can be used as an indicator of which way is east. If you are lost somewhere and you can’t feel that much of a breeze blowing, you can also look up to the treetops and see which way they sway to use the wind for navigation. It can be easy to get turned around in the wild and it all looks the same. This is why you should navigate while using markers. It can be something as simple as placing a fallen branch up against tree trunks or leaving behind a piece of your rope or other small maker to indicate that you are circling the same spot or have been that way before.